Quick Study: Aleksey Varlamov is a prose writer who writes short stories and novels but is probably best known for his biographies of writers, including Aleksey Tolstoy and Mikhail Bulgakov. The Varlamov File: Aleksey Varlamov was first published in 1987 when a story called “Cockroaches” appeared in the journal October. Varlamov has gone on to publish fiction in numerous other prestigious Russian “thick” journals but he has received particular notice—and popularity—for his detailed biographies of some of Russia’s best Soviet-era writers. The celebrated “Lives of Remarkable People” series includes Varlamov’s books about writers Aleksandr Grin, Mikhail Prishvin, Aleksey Tolstoy, Mikhail Bulgakov, and Andrei Platonov, as well as Grigorii Rasputin. Varlamov’s book about Tolstoy won him a second-place Big Book award in 2007. Varlamov Recommends: In that same interview on Echo of Moscow’s “Book Casino” show, Varlamov said his favorite work by Aleksey Tolstoy is Nikita’s Childhood. He also praised Tolstoy’s The Road to Calvary trilogy and Mikhail Bulgakov’s White Guard for their positive characters. 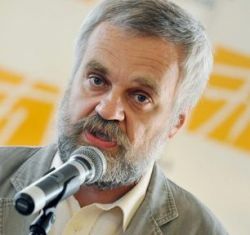 In an online forum with readers of Russian Newspaper, Varlamov listed many contemporary writers he enjoys reading, including Zakhar Prilepin, Aleksey Ivanov, Vladimir Makanin, Alexander Kabakov, Maya Kucherskaya, Roman Senchin, and Oleg Pavlov. He also praised Aleksandr Solzhenitsyn’s Gulag Archipelago as having great historical significance to Russia, said he enjoys Latin American writers (“but not Coelho!”) plus Haruki Murakami and Milorad Pavić, and finished the session by recommending Joseph Brodsky’s poetry. Another item from Russian Newspaper lists ten of Varlamov’s favorite books: they include The Bible, Dostoevsky’s The Demons, Gabriel Garcia Marquez’s One Hundred Years of Solitude, and Ray Bradbury’s The Martian Chronicles. © 2019 by Read Russia Inc.